The République du Kabinda (República de Cabinda) and the Frente de Libertação do Estado de Cabinda (FLEC) have concluded a Memorandum of Understanding with the United Micronations Multi-Oceanic Archipelago (UMMOA). 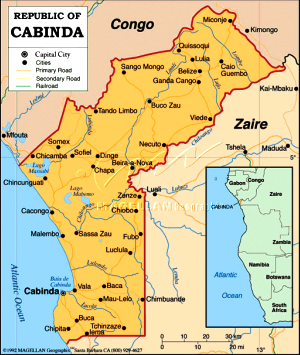 The République du Kabinda and FLEC are recognised as the only sovereign representative of the people of Kabinda (Cabinda), which has been engaged in a liberation struggle with the government of Angola. Kabinda is a member of the Organization of Emerging African States (OEAS) and the Unrepresented Nations and Peoples Organization (UNPO). The United Micronations Multi-Oceanic Archipelago (UMMOA) is recognised as a new political construct consisting of a multi-oceanic archipelago, with a platform dedicated to the protection of the environment, and is recognised by the International States Parliament for Safety and Peace (ISPSP). Kabinda and the UMMOA have mutually recognised one another, and will support each others claims in the areas of technical, political, financial, and multilateral cooperation. This entry was posted in Uncategorized and tagged Cabinda, FLEC, Kabinda, recognition, UMMOA. Bookmark the permalink.